TECHknitting: QUICKtip on conditioning knitting needles. If your needles are being grabby, run them through your hair (along the scalp) once or twice. The "preening oil" naturally on your scalp will help the needles slide through the wool more smoothly. 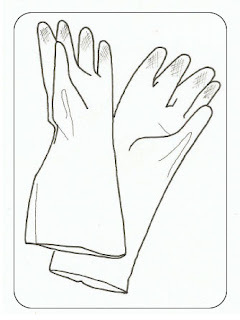 Conversely, if your needles are getting too slippery, put on clean rubber dishwashing gloves and massage the needles a little, then drag each needle between your pinched thumb and forefinger--no water, just drag the needles between the pinched, dry glove. This will clear oils, and restore a better "tooth." For a very slippery needle which does not respond to this treatment, a drag through a barely dampened, doubled over "Mr. Clean Eraser" will certainly restore tooth--the "eraser" is actually nothing more than micro-scale sandpaper. Be really careful before you go this route, however. Although some needles (like bamboo) respond splendidly to this treatment, other needles (like Addi lace needles) have a coating, and the "eraser" could ruin it.